The series, which begins at 9pm tonight, tells provocative and revealing stories from the inside out about how people survive without work. The series focuses on the lives of a group of people who are either in long-term unemployment, have never worked, or are growing up without any expectation of working. 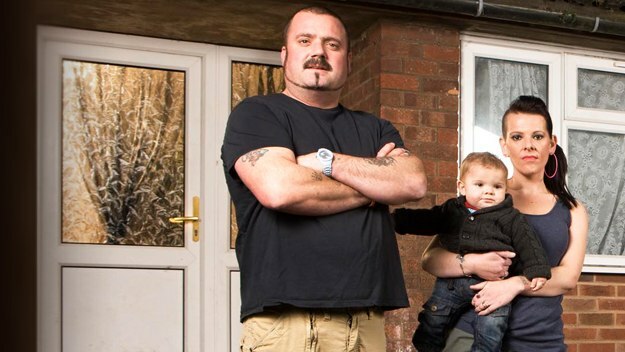 With access over nine months in Scunthorpe, Skint follows a father and step-father of seven, who used to work at the steelworks, and his friends and neighbours, many of whom live on an estate in one of the most deprived areas of the town. At its height the steelworks employed 27,000 people. It now employs a sixth of that number. With work continuing to be hard to find, the people featured in this series are thrown back on their own resources. Dean is candid about his feelings and responsibilities towards his wife Claire and his children – he has worked for 23 years and feels he deserves ‘a bit back’, no matter how big his brood. And he emotionally introduces his newborn son as the latest welcome addition to the family. With so many mouths to feed however, Dean and Claire begin to consider whether it’s time for the ‘snip’. In an area of high unemployment, crime is always going to be an issue – and Dean takes a pragmatic approach. With money tight Dean, like many of his friends, uses the service of the local shoplifters whether it’s getting food from ‘unofficial suppliers’ to fill up the fridge or buying stolen deodorant on the cheap – whatever he feels he needs to do for the family. But Dean is all too aware of just how challenging it can be bringing up kids when crime is all around. One of Dean’s neighbours Jordan, has just had her windows smashed in. Jordan’s 15-year-old son Connor has been excluded from seven different schools and relations between mother and son are at breaking point. Connor is supposed to go to a special residential school but would rather spend time with his friends on the estate, many of whom are already getting into trouble. How can school compete with his friends’ adrenalin rush of joyriding bikes around his estate? And how does Dean react as the impact of crime starts to be felt in his own family?